Last weekend, instead of idly relaxing, I made myself think…I read a book. Yes, it was an honest-to-gawd book. You know, cover, pages of words, zero pictures, the whole nine yards. After seeing and hearing about all of the content scuffles going on, I wanted to see if I could still do it and…it was neat, fun even. No one sent me their images, I created my own in my mind. What brought all of this mental exercise on was a series of reports on how much the industry is celebrating new and better content designed to entertain and sell us something. It all started with the upfronts when the television industry bravely unveiled their new TV shows… hopefully, whetting the appetites of viewers and advertisers. Seth Shapiro, of The Palmer Group, reported that there were 409 scripted shows in production in 2015, 455 in 2016 and over 500 this year. 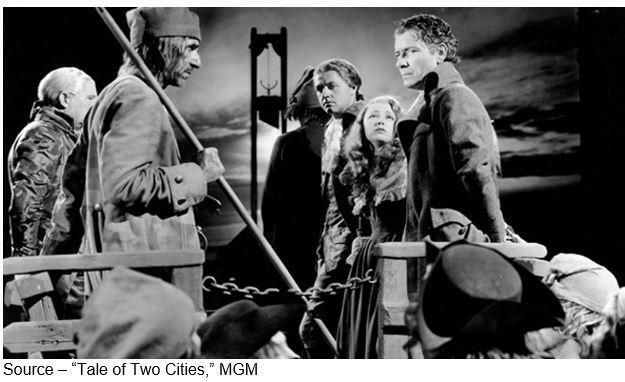 Then, it was the Cannes Film Festival that unveiled and celebrated what were theoretically the very best films from around the world. Next, comes the Cannes Lions; where the marketing and advertising community will herald and celebrate the best creative work to sell stuff. This will be followed by the report that big studios will join the Indie filmmakers on the fall festival circuit to kick off their major titles. All of that is really just a drop in the content bucket when you consider what the tens of thousands of independent filmmakers around the globe produce annually. Two-Tier – Today, there are still four networks – four in traditional television and four in cloud television. While traditional fixed day/time is shrinking, industry executives also see it shifting as the shows are still watched, just not when they were scheduled. And, the data-rich cloud networks are able to tell advertisers when, on what device and at times where viewers spent time with the content and advertising. To top off the video buffet, there’s the professional and amateur content available from FANG (Facebook, Amazon, Netflix, Google) that is changing the traditional TV viewing world forever. 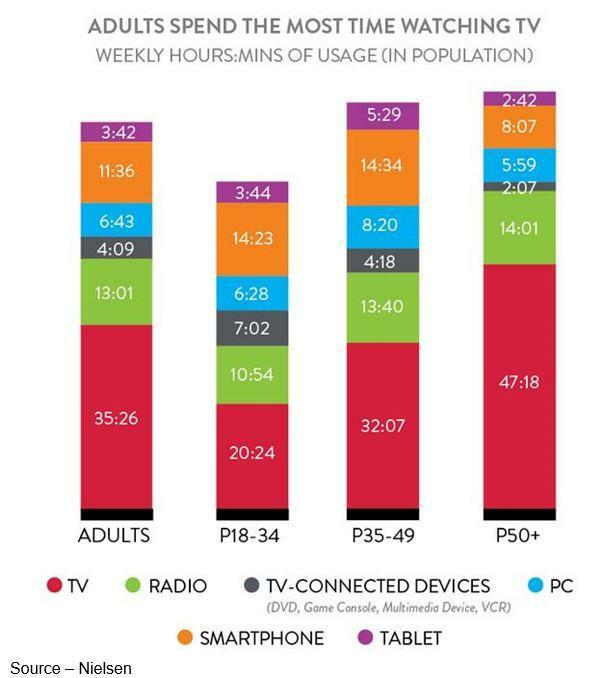 And it’s not just affecting the big four U.S. networks. Networks around the globe have become very comfortable in determining what you want to see and offering fixed day/time programming (and charging advertisers accordingly). About the time you finally got around to getting into some series…it was gone. Of course, the DVR (digital video recorder) changed that so you could watch them at your convenience. Balance was returned to your life. But folks got into the nasty habit of shifting everything – including the 6:00 p.m. news – which meant the networks/stations weren’t getting credit for this extended audience. So, they pressured the rating folks to give them credit for the eyeballs watching stuff in their own sweet time – after all, you couldn’t fast forward on the ads so the net/station might as well make a few bucks. Along the way, new players entered the lucrative field – HBO, MTV, ESPN, TBN, CNN – and they were added to the TV bundle. It wasn’t long before your TV bundle got real big to enrich your entertainment life with 300, 500, 1000 stations. Of course, you never watched 99 percent of the stuff but hey, it was available to you. When the first cloud network, Netflix, came on the scene bypassing the bundle and going direct to the consumer; very few in the industry paid much attention…until their shows won Oscars, Emmys, audience. That was okay until the rest of the FANG group found that they too could wean folks off the cable and even grab the up-and-coming generation that hadn’t gotten connected. Moving Online – People no longer live by the television program schedule, but rather their own. Many viewers have shaved or cut their cord, while younger folks never had a cord that delivered their entertainment; and they are free to watch their content on the screen that is close at hand. 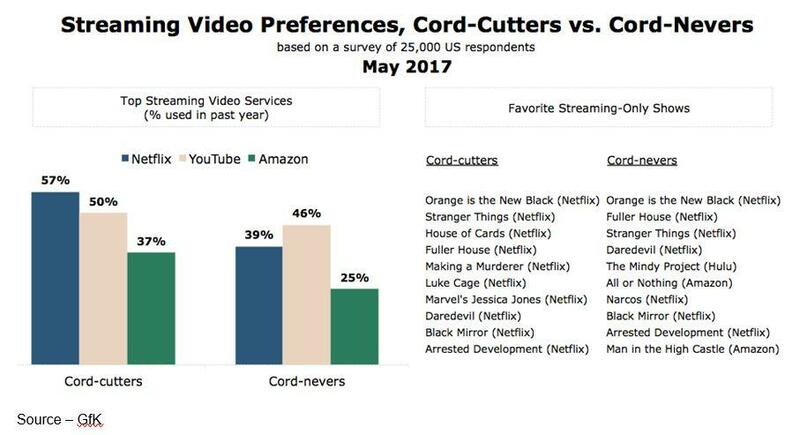 The growing number of cord-cutters and cord-nevers suddenly had a real impact on the network, station and cable service providers. Almost out of the gate, Netflix and Amazon were streaming content in HD (high definition); and as bandwidth improved, they kept pushing better quality – first 4K and most recently, HDR (high definition resolution). paying for whether you lived in the US, UK, Singapore, Dubai, Germany, Australia or wherever your Internet entertainment was offered. In 2017, the Consumer Technology Association (CTA) predicted that 40 percent of all units sold will be 4K, which brings the projected total number of units sold domestically to 34 million. Still #1 – The traditional TV screen continues to be the most popular way to view people’s entertainment, news and information. In addition, they increasingly watch multiple screens– even while at home, or shift to a mobile screen when they are away from home. And while it’s true that your long-form content is still mostly watched on a TV set, you could also catch up on your class, meetings, etc. in your spare time with one of your other screens. But how many 4K-compatible channels does DIRECTV broadcast? Three. Netflix, on the other hand, has a growing library of over 600 hours of 4K content—150 hours of it in HDR—which is available only with its highest-tier subscription at $12 per month. Amazon doesn’t charge extra for 4K content and is producing all of its originals in 4K. To shrink this widening gap between broadcasters and consumer demand and to level the playing field with streaming services, FCC chairman Ajit Pai has proposed an immediately available, voluntary upgrade from ATSC 2.0 to ATSC 3.0. This resulted in an IP-based system where broadcasters can transmit in 4K and with greater audio fidelity. 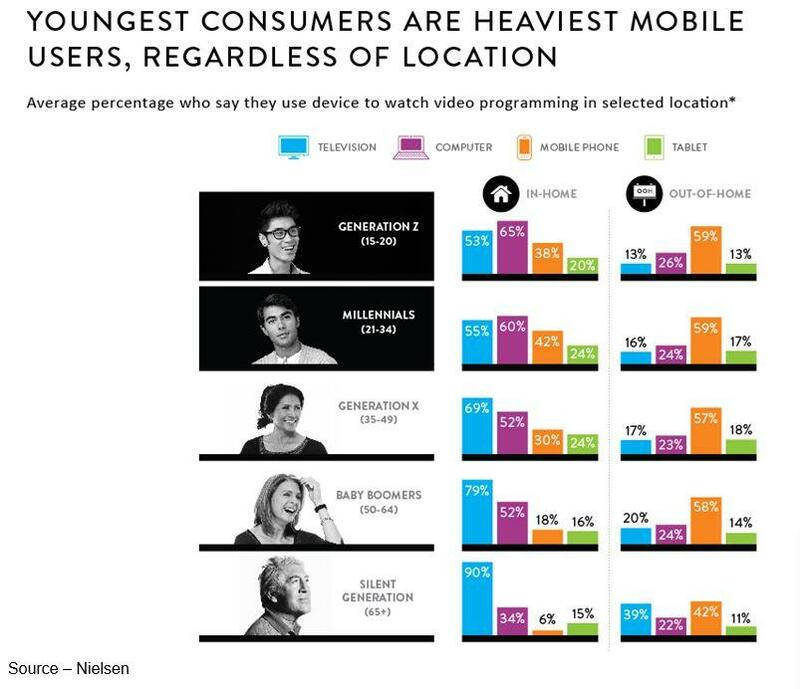 For teens and Gen Zers who started with the smaller screen, it’s a natural place to go first for their entertainment. Handy Screen – Teens and Gen Zers were almost born with a smartphone in their hands and they use it for all of their communications and content consumption. Their mobile entertainment has also rubbed off on other generations. Mobile is slowly becoming the screen of choice–especially when people are on the go and especially with the “up and coming” generations. It doesn’t come as much of a surprise that a recent AOL global study found that 60 percent of respondents said they “can’t live without their smartphones;” and 67 percent watch videos on their smartphone every day. While online video consumption is increasing across all screens and content; when it comes to mobile devices, short-form is growing faster. When it comes to advertising, shorter is also better – 10 seconds for preroll and short-form videos (1-9 minutes). While 15-20 second ads are tolerated (before people click away), mid-roll on videos 10-20 minutes in length. All of these new video outlets look like fantastic opportunities for independent filmmakers– especially on YouTube and Facebook. There are just a few stumbling blocks here. Personalized Video – While YouTube and Facebook are aggressively promoting their locations as the place people will go for their content, it remains to be seen if the two will become a major stopping point for professional video or casual entertainment. Most of the material on the two sites are mindless, user-generated stuff. You know, shot with a smartphone that hangs around for a few moments and then slips into oblivion. More than 700 hours of video are uploaded to YouTube every minute. Ninety-nine percent of it gets fewer than 10 views. The key is that filmmakers don’t have to have a tentpole production for it to be good for Netflix, Vimeo, Hulu, Facebook, YouTube and others. Today’s video entertainment does in fact fit very nicely onto Chris Anderson’s (former EiC of Wired) Long Tail. 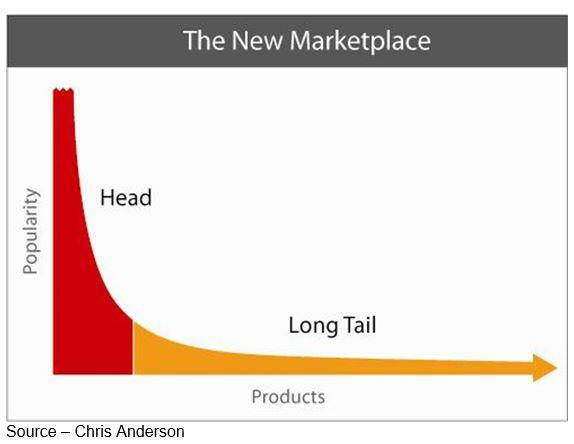 The Long Tail – Chris Anderson first advanced the concept of The Long Tail back in 2004; showing that there were relatively few big hits. The majority of content viewed and listened to was really specialized that interested a much smaller potential audience. It is even more relevant in today’s M&E industry. Only 10-100 video segments enter the market on the head of the curve and stay there for a reasonable period of time (3-6 months). Then, even they move to the long tail where they are viewed by hundreds and thousands over a long period. The challenge for the Indie filmmaker is that he/she isn’t done when the content is completed and accepted by one of the growing number of outlets. 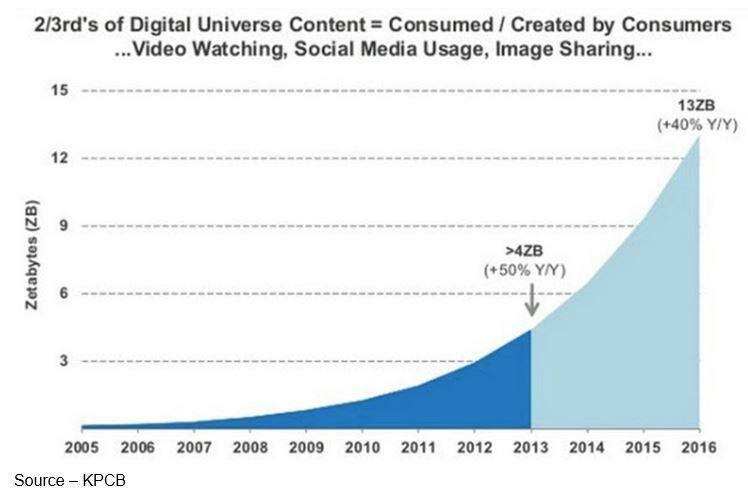 Digital video is dominating consumers’ screens with no signs of slowing down. Traditional and cloud networks have opened opportunities for everyone in the industry–not just the elite (and lucky) few. Video now accounts for roughly 70 percent of the internet traffic and according to Cisco; by 2020, it will represent 90 percent of the bandwidth being consumed. A recent Sandvine study concluded that viewers consume over 800,000 minutes of internet video per second each day. Some of that can be yours.